Swan River School Welcomes You! Our Swan River family sincerely welcomes you to the 2018-2019 school year and invite you to take a tour of our school. The staff of Swan River School is here to help students be successful, as well as have fun. Every student who comes to school ready to learn, with good attendance and good work habits, will succeed. Our student handbook provides a brief overview of school policies and procedures. It is also to help answer questions which may arise during the year. Please review the information thoroughly. If the answers to your questions cannot be found, please feel free to contact the school to clarify any concerns. The Swan River School staff welcomes parent volunteers and looks forward to parent participation when opportunities arise. 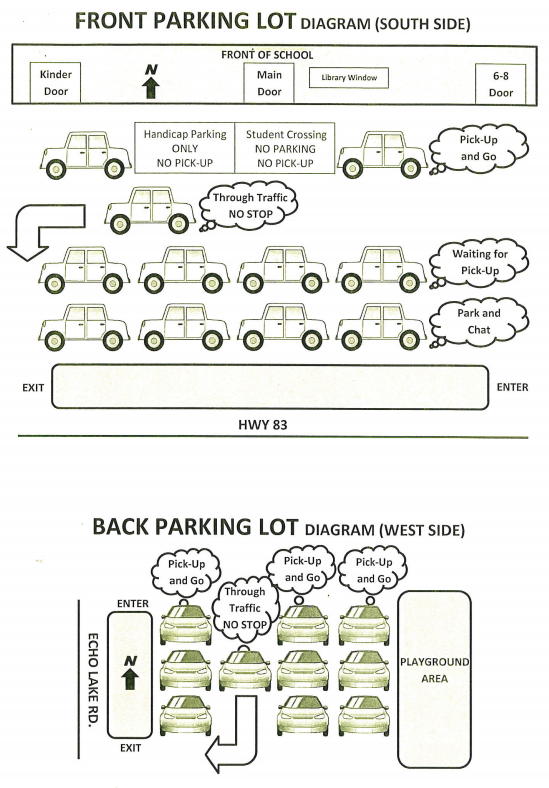 Click Here for the parking lot protocol for dropping off and picking up students from Swan River. Parents are encouraged to visit classrooms and their child’s teacher. You must check-in at the office to sign in before going to the classroom. We welcome and encourage all parent volunteers at Swan River School. Ask your child’s teacher if they need any help in their classroom or contact our PTO to offer your time. Swan River School is a GSuite for Education school, and we offer a free suite of online tools for every student K-8, as well as two classroom sets of Chromebooks.